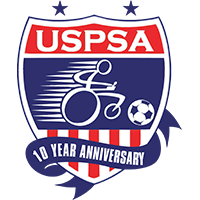 I attended the Federation Internationale De Powerchair Football Association (FIPFA) World Cup Opening Ceremony on July 5th in Orlando, Florida. Upon entering the venue, I reminisced on my past experiences with power soccer - one being my first day at MK Battery - MedTrade Fall 2014 in Atlanta, Georgia, where I was introduced to the sport and was simply AMAZED at the skills of the athletes. In the past 5 years, I have been to many power soccer tournaments but nothing prepared me for what I was about to experience at World Cup 2017. Having never played for my country, I could not imagine the gamut of emotions the athletes felt when putting on their country’s colors and singing their National Anthem at the top of their lungs. Indeed it was a very emotional moment for all the athletes as well as all that were in attendance; present company included. Soon though, there was a transformation from those emotions to focused determination as their game faces appeared; it was time to get to work as there was a job to be done…bringing home the World Cup. 2017 Team USA members Jordan Dickey, Peyton Sefick, Natalie Russo and Ben Carpenter visited Buenos Aires, Argentina in August to assist in the development of their players and coaches. Living in Woodbury, Minnesota most of his life, Pete Winslow has excelled at Power Soccer. The two-time Team USA World Cup member decided to participate in the sport seven years ago so that he could play on a team that had the same abilities as him. Team USA will be having their second training camp on their journey to the world cup. It will be held in Greenwood, Indiana at the Mount Pleasant Christian Church Community Center. The journey to the FIFPA World Cup has begun. Two weeks ago, 20 players from all over the US went to Indianapolis to tryout for the FIPFA World Cup Team. It was 3 days of intense evaluation and drills from 9am to 9pm.